Good: New premium pack format shakes the line up, serial-numbered base cards should help long-term collectibility, Gold Plaque cards look fantastic, solid odds on a major autograph. Bad: Some autographs are definitely stronger than others, no text on card backs. 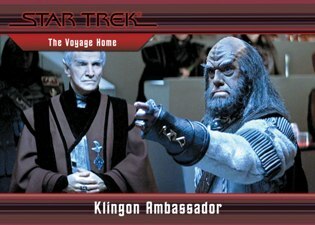 The Bottom Line: 2011 Rittenhouse Star Trek Classic Movies: Heroes and Villains is the first premium pack set for the popular franchise. For some, it’s a jolt that they might not be comfortable with. But after dozens of sets over the years, how much ground is there left to cover? This is a release that offers more bang than previous sets at a reasonable value, if you break it down to cost per hit and insert. Factoring in the relatively good odds of getting either a William Shatner or Leonard Nimoy autograph, this may be one of the strongest Star Trek sets in years, at least from a value perspective. Rittenhouse does a good job with the base set photography. The dual-sided cards are done in a horizontal format appropriate for the widescreen cinematic theme. The big tradeoff, though, is that with full photos on both sides there are no text explanations. On the insert front, things are fantastic. The Die-Cut Gold Plaque cards are particular standouts. 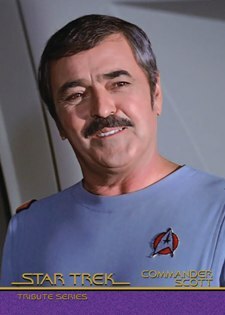 I’m not always the biggest fan of gold foil, particularly huge amount of it, but they certainly work here framing a portrait-style photo of a bridge crew member. 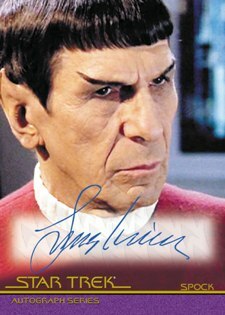 Both the autographs and Tribute cards use the familiar but strong signature card style that has been used across several other sets. Given the premium format of this release, the main focus really is about the chase with the main one being the autographs. Having both William Shatner and Leonard Nimoy signing for the same set is big. Add in the first-ever autograph card of 80s icon Christian Slater and Brent Spiner, and you’ve got a good core. But outside of this quartet, there aren’t a lot of other names for non-Trek fans to get excited about. With either a Shatner or a Nimoy autograph promised in every box, the odds of pulling one of the two iconic autographs has never been better. Some of the other signers add further value, either by their name recognition or their rarity. Where this set really stands out is with the smaller things. By adding a simple serial number to the base cards, Rittenhouse has ensured they hold better than most base sets made today. The Gold Plaques and Tribute cards are also serial numbered. 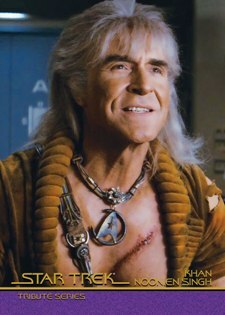 2011 Rittenhouse Star Trek Classic Movies: Heroes and Villains has so much going for it despite its small packaging. I’ll admit I wasn’t sure what to expect with such a popular brand going the premium route, but it works. At this point, is there really a need for another full base set? Probably not. Instead, the focus shifts to the chase. The combination of attractive inserts and built-in value make this one of the better Star Trek sets in some time. 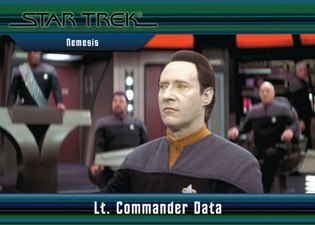 Star Trek Classic Movies: Heroes & Villains is the first release in franchise history to get Rittehouse Archives' premium pack format. Brimming with two autographs per nine-card pack, signers include William Shatner, Leonard Nimoy, Christian Slater and Brent Spiner. Rittenhouse is promising either a Shatner or Nimoy in every box. The 54-card base set features sharp hi-res images and is limited to 550 numbered copies. Inserts include 14 Die-Cut Gold Plaques (/425) and 12 Tribute cards (/450). This is the most limited Star Trek set produced to date. 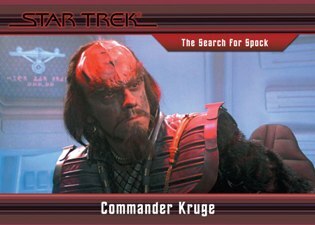 The Star Trek Classic Movies: Heroes & Villains base set has 54 base cards. Each is numbered to 550 copies and features a hi-res photo. Five base cards are inserted in every pack. Autographs (20 cards) fall two per pack. Rittenhouse promises that each box will have either a William Shatner or Leonard Nimoy signature. Other highlights include Christian Slater and Brent Spiner. 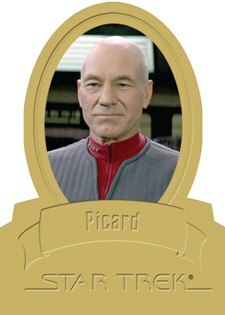 One Die-Cut Gold Plaque card is included in every pack.Highlighting major members of the crew, the 14-card set is limited to 425 numbered copies. 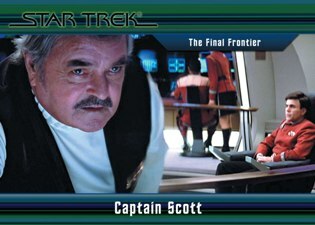 Twelve Tribute Cards (/475) honor cast members who have passed away. Inserted one per pack. Sealed boxes come with one of two Bridge Crew Patch cards numbered to 250 copies. Rittenhouse is offering an exclusive Nichelle Nichols autograph as a four-box incentive. An exclusive binder is available to house the cards in.